Norman Walford, the last officially employed tracker in NSW, retired from the NSW Police on 3 May 1973 after a career of 25 years. He is well-remembered in Walgett today – there is a walkway in his honour along the edge of the Namoi River – and his wife, Mrs Gladys Walford (nee Kennedy) lives in town. And many Aboriginal residents from nearby settlements such as Coonamble and Goodooga know of his work for the police Interview with Henry “Puss” Robinson, Coonamble, 3 May 2015; Interview with Johnny Bishop, Goodooga, 5 May 2015..
Tracking was a common skill in the Walford family. His father, Albert Walford, who was born at Gingie Station near Walgett in 1885, is believed to have worked as the Walgett tracker in 1913 Interview with John Walford, grandson of Albert Walford, at Redfern, 15 April 2009. Albert’s brother Archie Walford was the tracker at Cumborah, 40km north-west of Walgett, in 1908. 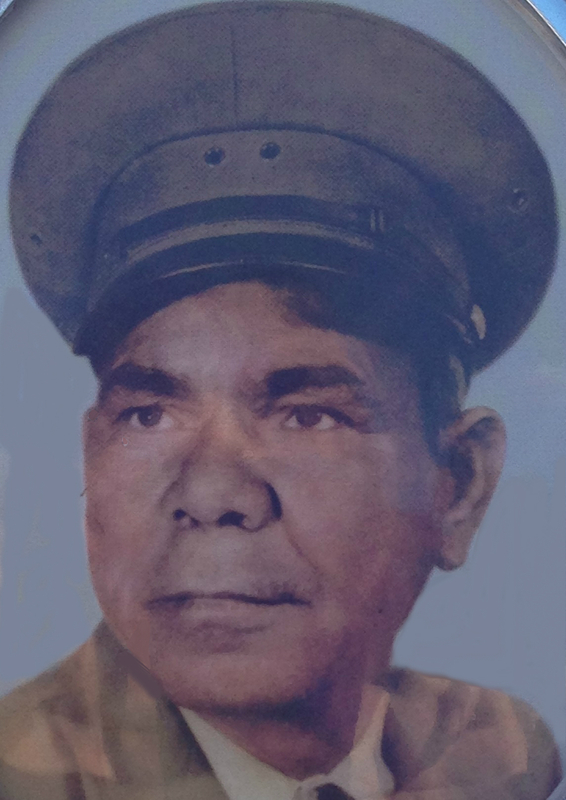 Norman’s brother, Albert Walford Jnr also worked as a tracker and passed knowledge on to him (Interview with Dianne Walford, Walgett, 17 June 2014).. By this time he was already married to Nellie Brown, an Aboriginal woman from Boorooma whose father, Charlie Brown, spoke Muruwari and came from the country to the north of Enngonia Nellie was also remembered as a language speaker, although the name of the language was not recorded (Walford 2003: 1-2).. Nellie and Albert were married according to “Aboriginal rites”. Albert Walford also worked as a boundary rider and he was engaged in this occupation in December 1923 when Norman was born on Old Llanillo Station between Lightning Ridge and Goodooga. A witness listed on the birth certificate was Minnie Clarke (nee Nicholls), an old Aboriginal woman born in the 1850s. Minnie had ties to the Ngiyampaa language group and was probably a midwife BC of Norman Walford 1923/053502..
As was the case for many trackers in the 19th century, Walford grew up learning about traditional culture and pastoral station life. He had the classic mix of skills that trackers required. Before working for the police, Walford was employed as a labourer and shearer on properties in the Walgett district. An advantage of this skill set was that he could return to pastoral employment if the tracking work ran out, although the changing nature of the pastoral economy, including the increasing use of trucks, motor bikes and machinery, meant that demand for labour was slipping. Norman Walford’s main role as a tracker was looking for people lost in the bush, still a common occurrence in the second half of the 20th century. He once found a fellow who was lost on the Brewon Station side of Carinda. In this instance he was assisted by Bill Kennedy, then a young Aboriginal man living in Walgett. He was also licensed to operate four wheel drive vehicles, enabling him to get to remote areas more quickly. Some jobs took him as far as Lightning Ridge and Goodooga. Mrs Walford also recalled that her husband saved many people from drowning in the Namoi and Barwon Rivers. It is appropriate that the walkway honouring him is located by a popular swimming spot Interview with Bill Kennedy, Walgett, 17 June 2014; Interview with Mrs Gladys Walford, Walgett, 30 October 2014; Norman Walford Record of Service, SRNSW..
For much of his working life, Walford lived on the Namoi Aboriginal Reserve on the northern fringe of town. His residence was a little tin humpy and his mother lived in the humpy next door until she passed away in 1963. She was famous for her curry and johnny cakes cooked in the camp over and many other family members who lived nearby would drop in to visit. Water for cooking and washing was wheeled up from the river in 44 gallon drums. The Walford family moved into a Hope Street residence in town in February 1966 Norman Walford Record of Service, SRNSW; Walford 2003: 1-2; DC of Nellie Walford 1963/007827.. Detailed records survive of the uniform and clothing issued to Norman Walford as part of his job. Across the years he was given two water-proof capes, over 20 pairs of boots, 34 pairs of trousers and a great coat. These are clearly the accoutrements of an outdoor life. The police also kept detailed medical records and sent Norman to a doctor when he was ill. He injured his back in November 1958 and was off work for a week. A series of illnesses in the early 1970s hastened his retirement. 1. ↑ Interview with Henry “Puss” Robinson, Coonamble, 3 May 2015; Interview with Johnny Bishop, Goodooga, 5 May 2015. 2. ↑ Interview with John Walford, grandson of Albert Walford, at Redfern, 15 April 2009. Albert’s brother Archie Walford was the tracker at Cumborah, 40km north-west of Walgett, in 1908. Norman’s brother, Albert Walford Jnr also worked as a tracker and passed knowledge on to him (Interview with Dianne Walford, Walgett, 17 June 2014). 3. ↑ Nellie was also remembered as a language speaker, although the name of the language was not recorded (Walford 2003: 1-2). 4. ↑ BC of Norman Walford 1923/053502. 5. ↑ Interview with Bill Kennedy, Walgett, 17 June 2014; Interview with Mrs Gladys Walford, Walgett, 30 October 2014; Norman Walford Record of Service, SRNSW. 6. ↑ Norman Walford Record of Service, SRNSW; Walford 2003: 1-2; DC of Nellie Walford 1963/007827.